We hope that you have a lot of fun learning Spanish on our site which provides an enormous amount of content to learn spanish free online! Whether you are a total beginner, improver or advanced student learning spanish, there should be something here of value for you. Spanish language learning might seem like a daunting experience, but it doesn`t need to be so. Our site is basically structured so that you can start with a spanish lesson on some easy situational material, for example: family life; shopping; travel and leisure, etc. 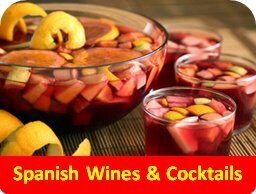 Then move on to a range of articles in both Spanish and English on all aspects of life in Spain and Spanish-speaking countries, all the really interesting stuff that we enjoy such as food and wine; travel; sport; culture; and famous destinations. See the links below for our full range of topics. Keep up to date with site developments and other articles of interest on our blog, or join us on Facebook and Twitter. 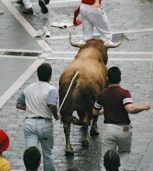 The festival of San Fermin and the running of the bulls (el encierro) takes place in Pamplona, Navarra, every year in the second week of July. Learn about el chupinazo, el encierro, the rules and buy books on San Fermin. NEW! 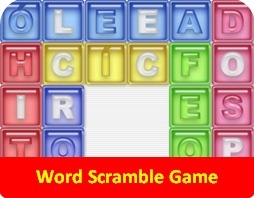 San Fermin wordsearch and San Fermin jigsaw. Learn the basics with our common Spanish vocab and phrases and fun learning situations such as at the hotel and at the restaurant. See conectores textuales for help with Spanish essay writing and Spanish oral exam useful linking phrases. Nobody likes learning grammar but we have tried to make it fun! 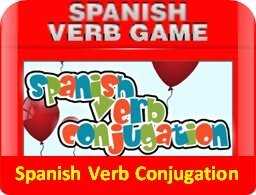 Learn how to conjugate the fun way with our verb conjugation flashcards and verb conjugation game. We also cover key topics such as por vs para, ser vs estar and the subjunctive. 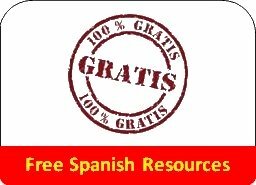 A handy list of free Spanish resources to help teachers and students, including media links, interactive and downloadable crosswords and wordsearches. 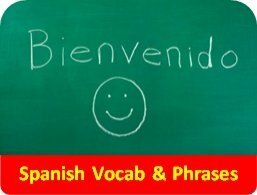 We also provide some useful web links to other interesting Spanish learning sites. Interested in taking an independent learning Spanish course but not sure which is the best for you? See our Spanish Courses reviews to help you decide. Not sure of the meaning of a Spanish word? 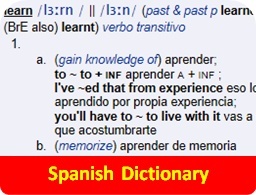 Check the online Spanish dictionary for possible translations plus example phrases. 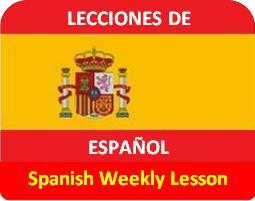 Make sure you check back weekly to learn from the Spanish lesson of the week. 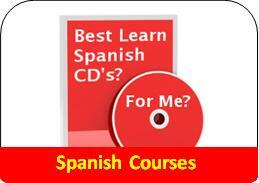 Lessons cover a range of Spanish grammar topics, e.g. the subjunctive. 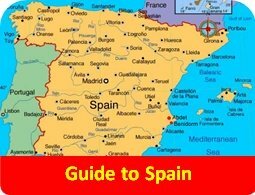 Visit our Spain pages for a user's guide to some of the most popular towns and cities in Spain, such as Barcelona, Madrid and Alicante. Sample the top Spanish beaches on offer and read the quick guide to the top Spanish resorts. View our calendar of Spanish fiestas to find out what's going on in Spain, when and where. Don't miss our dual-language pages on Las Fallas, La Tomatina (the huge tomato fight! 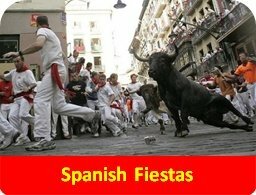 ), San Fermin (the running of the bulls) and El Festival de las Cometas. Throwing a latino-based party? 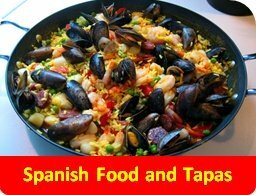 See our tapas page for some easy-to-make Spanish treats, including paella, tortilla española and patatas bravas. Learn about typical regional dishes and check out our top Spanish restaurants. In our wines pages, we recommend some of the best Spanish wines. Mike`s weekly choice of top Spanish wines also compliment our Spanish wine dishes. View our cocktails guide to learn how to make such favourites as a Mojito and Sangría. 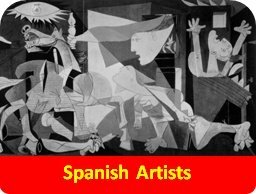 Visit our top Spanish artists page and read about their work and lives, such as Picasso and his famous painting, Guernica. See also our favourite Spanish films, such as Pedro Almodóvar's Volver, starring Penélope Cruz. Find out more about some of the most famous traditional 'Spanish Musicians' on our dual-language pages. Then experience a whole range of Spanish/latino music in our 'Spanish Lyrics, Translation and Exercises' section. 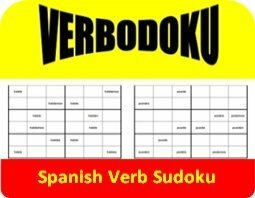 Based on the concept of the popular Sudoku puzzles, Verbodoku puzzles provide an alternative and fun way to test yourself or your students on the conjugation of Spanish verbs. 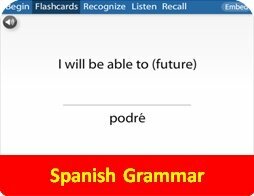 Play our Spanish Verb Conjugation game to test and improve your knowledge of Spanish verbs - choose your tense (even does subjunctive!) and play away! To focus on a particular verb, see our flashcards. 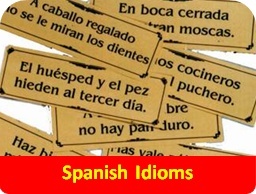 Impress the natives by throwing some Spanish idioms or Spanish proverbs into conversation! Or even more so, amuse your colleagues with a joke told in Spanish! Love playing video games but should really be practising your Spanish verbs? 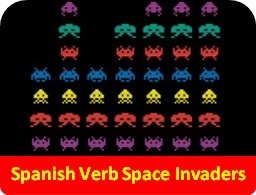 Combine the two with this Spanish Verb Conjugation Space Invaders game. 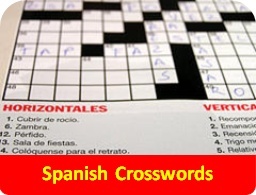 Test your Spanish using our Spanish Crosswords - Crucigramas - on verb tenses and topics ranging from the beach to the weather. Also see our wordsearches on Spanish food and Spanish cities.